The Pro7411WT (White Toner) lets you print in breathtaking color-plus-white on transfer sheets that can be used with a wide variety of substrates. The OKI Pro7411WT (White Toner) lets you print in breathtaking color-plus-white on transfer sheets that can be used with a wide variety of substrates. It features enhanced High Definition (HD) Color Printing and Single Pass Color™ technologies, with a straight-through paper path, for results that ordinarily require expensive manual printing processes. No more having to screen-print to get white lettering or graphics – Now you don’t have to compromise on your designs or worry about how vibrant colors will look on dark material. The Pro7411WT enables end users to easily print in-house what they need, when they need it. The Pro7411WT handles a wide range of transfer media sizes and weights, from letter- and legal-size to postcards and CD labels. Transfer media and sheets up to 140 lb. index (250 gsm) are fed into the unit’s 100-sheet Multi-Purpose Tray. For day-to-day printing, the Pro7411WT has a 530-sheet Paper Cassette, and prints in color plus black through a mix of Cyan, Magenta and Yellow toner. Fast print speeds for increased productivity – With a color print speed of up to 8 ppm on transfer media and up to 34 ppm on day-to-day standard media, the Pro7411WT keeps work flowing smoothly. 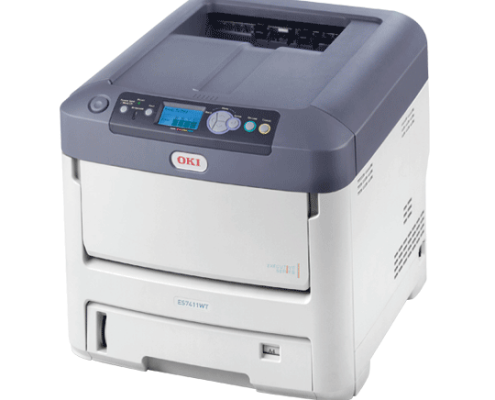 Print full color and high definition white cost effectively with the OKI Pro7411WT. Its small footprint, compact design and affordable entry level cost provides the complete transfer solution. The Pro711WT outputs vibrant, outstanding color and revolutionary high definition white for transferring up to 8.5” x 14”. Image onto white or dark t-shirts, garment decorations, hard surface applications and many promotional market items. 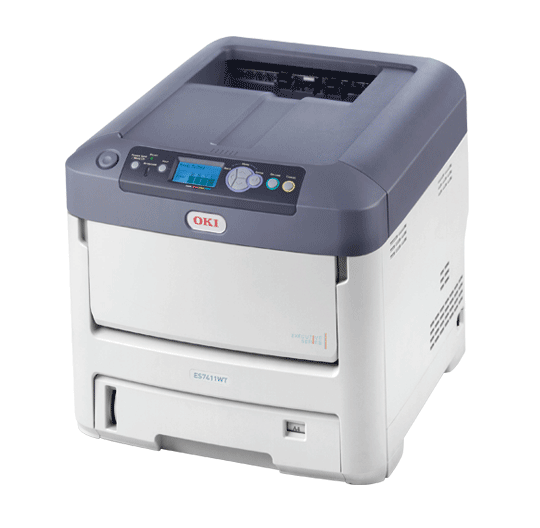 OKI Pro7411WT can print any type of file. Vector files are best for heat transfer applications.